Run my Java Applets for detailed lunar (and solar) data. You may run my programs for private not commercial use only. Please enable Java in your browser preferences. This interactive applet displays the positions of the Sun and Moon on the horizon for any date, time and location, and on a world map with day and night regions. The times of rise and setting, the declination, the Greenwich hour angle of sun and moon, the equation of time, and more data are computed. This Java applet displays the azimuth of the Sun and the Moon at rise or set. A table can be generated. Moon Data Altitude, azimuth and phase of the Moon. Moon Java applet showing the phase and the age of the moon for any date, and computing the duration of the lunation. This Java applet computes the motion of the moon (true longitude) and display the orbit. The applet is computing the distance of the Moon from the Earth (kilometers), the apparent angular size (arc minutes), the illuminated fraction of the disc of the Moon (per cent), the Moon's phase, and the times of apogee and perigee. 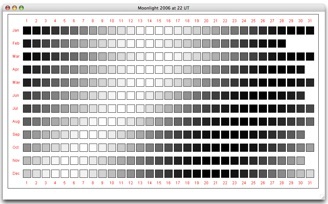 The brightness of the daily squares ist proportional to the illuminated fraction of the Moon.